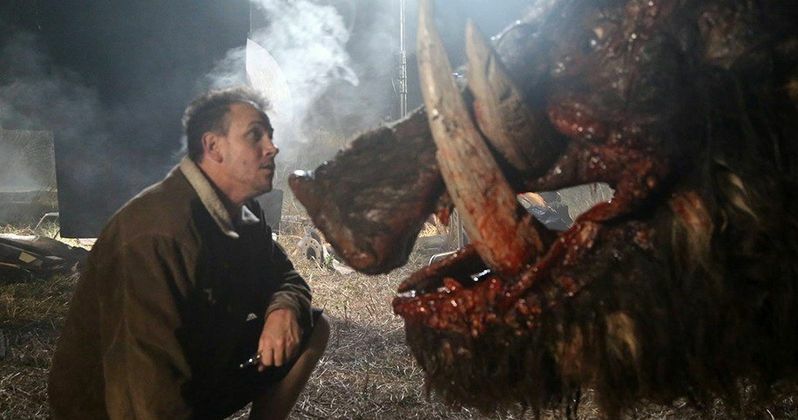 The trailer for the Australian Outback horror movie Boar is finally here and it features, you guessed it, a giant killer pig. Chris Sun (Charlie's Farm) directed Boar and it features an all-star cast getting ready to turn into wild boar food, including John Jarratt, Simone Buchanan, Bill Moseley, Melissa Tkautz, Nathan Jones, Roger Ward, Hugh Sheridan, Ernie Dingo, Chris Haywood, Ricci Guarnaccio, Emily Williams, and Steve Bisley. The trailer looks dark and intense with even some insight into the killer hog's point of view. The Boar movie was originally supposed to come out in July of 2016, but in ran into some financing difficulties, which the production has overcome. Horror fans have been waiting nearly 2 years to see what was up with Chris Sun's new offering, and it does not disappoint. The trailer features a boar in the Australian outback, which is staggering in size, with a non-stop, driving lust for blood and destruction. Watch the Boar defend its territory, as it cares for no one and kills without a single thought or care in the world. Boar looks like it gets super violent and bloody in a very short amount of time. At first nobody knows what the creature is until one night a wrecked car is found without the drivers. The man who discovers the accident accidentally stumbles upon the giant, bloodthirsty boar and lives to tell his tale. From there on out, it's a vicious assault on the senses with a look from the boar's eye that is reminiscent of The Predator mixed with the psychedelic look of Annihilation, which might be why the boar is so crazy. It seriously looks like it's on drugs. Legend has it that the giant boar was a myth, a legend brought to life in a drunken pub tale. The thing about myths and legends, they are usually made up of partial truths, and in this case, complete and terrifying truths. Tearing a path of destruction through fencing and livestock, locals haven't a clue of the chilling death that lurks in the striking Australian outback. Tearing up a path of destruction is one way to put it. If the Boar trailer is half as brutal as the trailer, horror fans are in for an awesome treat. The Boar movie will premiere Friday, April 13th at the Brussels International Fantastic Film Festival with the rest of the premiere dates all over the world coming soon. More news is expected to drop soon about Boar, so keep an eye for streaming and Video On Demand dates as well as Blu-ray releases. Until then, you can check out the wonderfully violent and bloody trailer for Boar, below courtesy of Christopher Lee Sun's YouTube channel, and double think that next family vacation out to the Australian Outback. There might be a giant murderous boar waiting in the brush.